THE STORY - After the sudden death of her family, firearms heiress Sarah Winchester becomes convinced that she's haunted by the souls of those killed by guns. Winchester then decides to build an enormous mansion that's designed to keep the evil spirits at bay. When skeptical psychiatrist Eric Price visits the estate to evaluate her state of mind, he soon discovers that her obsession may not be so far-fetched after all. THE GOOD - The production design and the care that was put into making the mansion. The acting from Helen Mirren and Jason Clarke barely holds our interest. THE BAD - Literally everything else. Poor script. Terrible jump scares. ​​In the Early 1900's Sarah Winchester built a mansion so sprawling that it's rumored that to this day that part's of it have never been visited since being built. Sarah even claimed that ghosts told her to build it. Doesn't this sound like a great premise for a great horror movie? The Spierig Brothers have officially made two of the most disappointing horror movies in recent memory. They directed last year's lackluster "Jigsaw" and now they're back to put us to sleep with "Winchester." While "Jigsaw" felt like a low budget fan film, "Winchester" just comes across as a lazy haunted house movie. 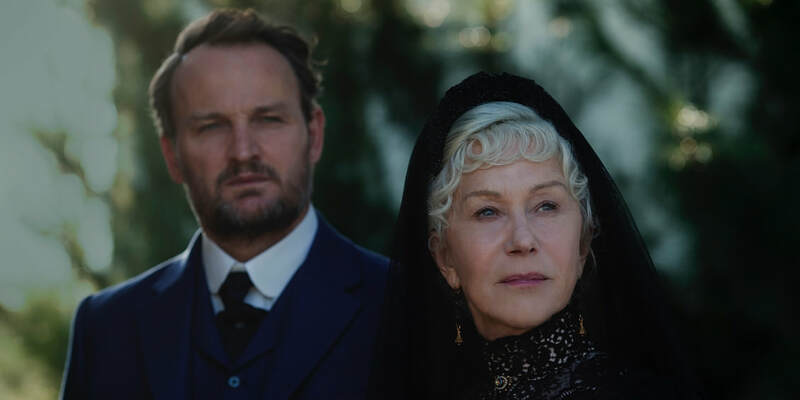 "Winchester," tells the fictionalized tale of the real-life person, Sarah Winchester (Helen Miren). Sarah is the heiress to the Winchester repeating arms company. Eric Price (Jason Clarke) is a psychologist that is hired to determine if Sarah is actually seeing ghosts or if she is insane. Sarah claims that the mansion itself houses the shots of everyone that has ever been killed by a Winchester rifle. Once Eric gets to the sprawling Winchester mansion, he quickly starts to see that things are not as they seem and comes to realize that he has a strange connection to the house itself. It's crazy to me how an actor of Helen Miren's caliber was drawn to such a pedestrian script. Penned by the Spierig Brothers and Tom Vaughn, it never manages to offer up the gothic horror that a premise such as this deserves. Every scare in the film is telegraphed from a mile away. Not once did I feel like a jump scare was earned. Even the mystery of the movie is underwhelming once revealed. The brothers literally show you in the opening moments that ghosts exist, so we are never left wondering if Sarah Winchester is crazy or not. There is a side story involving Eric's drug abuse that literally goes nowhere and his connection to the house is dubious at best. All of the supporting characters are underwritten and mostly serve as caricatures of supporting characters from better horror movies down to the scary possessed kid cliche. "Winchester" has many, many flaws, but it does manage to get a few things right. The production design of the mansion itself is fantastic and highly detailed. Each specific room inside the mansion has its own personality and feels unique. Sadly, we are only shown a few different rooms and to be honest, I would have liked to have seen more. For a movie about a haunted house, it was a smart decision to have said house feel like a character in the movie. Both Miren and Clarke excel in the face of a terrible script that tries as hard as it does, it cannot fully hinder their excellent acting choices. Helen Miren especially, truly sells Sarah Winchester as a real person in a fully realized performance. I wish "Winchester" had been able to live up to the incredible true story on which it was based. Instead, we are given a movie that wants to be a knockoff version of the much spookier and well made, "The Conjuring." Unfortunately, "Winchester" squanders a terrific cast by saddling them with an extremely dull script. Even die-hard horror movie fans will struggle to find much to adore in this mess of a movie as the jump scares are poorly done and cheaply choreographed. The biggest crime "Winchester" commits is how much of a misfire it really is.